Fafnir – Nordic Journal of Science Fiction and Fantasy Research, Volume 2, Issue 4, pages 59-65. Brett M. Rogers and Benjamin Eldon Stevens (eds.). Classical Traditions in Science Fiction. Oxford: Oxford UP, 2015. ISBN 978-0190228330. 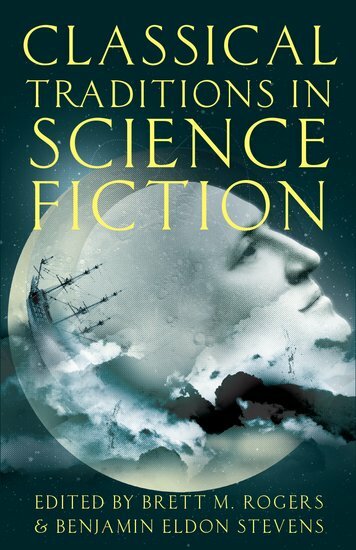 Classical Traditions in Science Fiction, edited by Brett M. Rogers and Benjamin Eldon Stevens, examines the many links that exist between Classical myth, history, and philosophy and science fiction. The scope of this volume is broad, not just in terms of time and genre, but also in epistemological considerations. The essays do not merely contain discussions of direct influences from classical sources intentionally borrowed by producers of science fiction, they also examine questions such as: what constitutes science fiction? Where does the history of science fiction begin? What impulses create science fiction? How do issues and ideas from the ancient past persist in contemporary science fiction and in the popular mind, even when audiences and producers do not know that they are there? In their introduction to the volume “The Past is an Undiscovered Country,” Rogers and Stevens assert that “the classics” are often “made into vivid signifiers neither of the ancient past, nor even of professional knowledge of antiquity, but or a present moment: an advanced post-modern moment marked by a recomposition of past cultural products that is omnivorous” (10). In this way, producers reconstitute material from the past that speaks to our conditions in the present, and in the future. The first section, “SF’s Rosy-Fingered Dawn,” contains essays that examine the roots of contemporary science fiction in both classical and early modern sources. Moreover, as the editors assert, this section explores the pivotal moments in early modern literary history when medieval allegories became something more modern, and fictional narratives were used by Renaissance writers “to distinguish ‘science’ from ‘religion’” (20). In this way, early modern writers were able to tap into the traditions of the past and recycle archetypal characters, paradigms, settings, and epistemological questions from ancient literature into new material that could speculatively explore the new scientific discoveries of the era. With the advent of the Protestant Reformation, many of the medieval powers that had censored fiction were now gone, and writers were more free to secularly contemplate the nature of the cosmos, from the moon to the center of the earth, without as much fear of repercussions from authorities. Additionally, many of these speculative fictions began to address moral dilemmas as well—some were intricately connected to issues of scientific inquiry, while others simply used speculative fiction as a veil to explore issues that were already of great importance in the contemporary world, but needed something to displace the criticisms levied at various aspects of society. With this section as a foundation for the rest of the volume, the editors trace the links between ancient literature and modern SF via the seminal speculative texts of the early modern era. This volume begins, appropriately, with what many consider to be SF’s starting point: Johannes Kepler’s Somnium, a satirical work first published posthumously in 1634 that attacks the idea of a geocentric universe. In this work, Kepler imagines that were there inhabitants on the moon, they might hold the erroneous belief that the moon was the center of the universe, due to their point of view. Clearly, this work supports the findings of Copernicus and challenges the notions of geocentric conservatives, but what interests Dean Swinford most in his chapter, “The Lunar Setting of Johannes Kepler’s Somnium, Science Fiction’s Missing Link,” is how Kepler based many of his pioneering SF elements on classical sources. Swinford points out that Kepler was a trailblazer in using “a fictional frame to make a point about the specifics of astronomy” (34) and in envisioning the worlds beyond earth, particularly the moon, as inhabited (35). Yet while these elements are of great consequence to the development of SF, Swinford points out that, in many ways, they were nothing new; rather, they were continuations of narrative traditions found in antiquity. Swinford writes: “While the Somnium may be said to inaugurate SF as a modern genre, it is clearly indebted to a classical tradition that employs many of the same tropes that Kepler bends to his scientific thesis, including fictional travel to the fantastic islands of the Western seas and that one ‘island’ floating above the sea, the moon” (35). In so doing, Kepler’s Somnium uses narratives from antiquity in a way that anticipates the space-travel SF that is to come in the ensuing centuries. Swinford cites two sources in particular, Plutarch’s The Face on the Moon and Lucian’s True History, as the work’s primary classical influences. True History contains a story of a journey to outer space with inhabitants on the moon, but Plutarch’s work is considered the more influential of the two (35). In The Face on the Moon, Plutarch imagines a dialogue amongst several characters representing different philosophical points of view about the moon, some mystical and some scientific. Ultimately, Swinford writes, “the dialogue has as its primary purpose the representation of the moon as something quite mundane” (39), and the text supports the notion that the moon, like the earth, is merely a geometric object, devoid of mystical properties (40). As proof of how important The Face on the Moon was to Kepler’s thinking, Swinford points out that Kepler desired a full translation of the work printed as an appendix to the Somnium (29). However, as much as Kepler desired to promote a scientific view of the moon, Swinford observes that he was never quite able to shed his mystical beliefs about it, and the moon is both “a resting place for souls in transit, and … a body with mass that obeys physical laws of motion (28). In this way, Somnium is a text that looks backwards as well as forwards: backwards to the classical past and forwards to a scientific future. In the following chapter, “Lucretius, Lucan, and Mary Shelley’s Frankenstein,” Jesse Weiner posits that science fiction is “a genre concerned, not only with the speculative possibilities of science, but also with the ethical boundaries of human knowledge” (46) and that in Frankenstein, often considered the first SF novel, “works of Greek and Latin literature serve as sources of ethical orientation” (47). Though both Plutarch’s Lives and the subtitle’s allusion to Prometheus figure prominently in the novel, Weiner focuses on two works that have received less critical attention as influences on the novel: Lucretius’s De Rerum Natura and the Erichtho episode of Lucan’s Bellum Civile. Weiner argues that Shelley took from De Rerum Natura Lucretius’s notions of atomism. Weiner notes that Lucretius defined monstrosity as “discordant assemblages of limbs” and that he furthermore argued “against the existence of mythological monsters on the grounds that such atomistic combinations are prohibited by the laws of nature” (52–53). Not only does Lucretius’s influence ground Frankenstein’s creation as a monster due to its unnatural assemblage of parts, but it also roots the novel in an intellectual tradition that is entirely secular. There are no gods, no spirits, no mystical forces, only a scientist and his unnatural creation struggling with the ethical dilemmas that define their mutual existence. From the Erichtho episode of Bellum Civile, Shelley adopts Lucan’s condemnation of necromancy, and Weiner argues that some of the scenes in Frankenstein that describe the monster’s ghastliness are borrowed from Lucan. Frankenstein’s monster is then doubly monstrous as defined by these classical authors, both as a combination of disparate parts and as a reanimated corpse. Frankenstein, written near the nascence of the Industrial Age, presciently captures many of the ethical concerns that the SF of the following centuries will grapple with. Much as with Kepler’s Somnium, Weiner observes that “Mary Shelley’s intertextual strategies look backwards, acknowledging several millennia of literary tradition, while the novel she wrote has been credited with establishing a new and distinctly futuristic genre” (73). As such, Weiner concludes, Frankenstein fits in with a host of other SF works that peer into the future through the frame of the classical past, which explore both the tensions and the connections between the future and the past (73–74). Just as Somnium and Frankenstein do much to replace mystical viewpoints with scientific ones, so too does Jules Verne, as Benjamin Eldon Stevens argues in “Virgin in Jules Verne’s Journey to the Center of the Earth.” In this essay, Stevens explores a number of ways in which Verne engages Virgil through direct quotations, allusions, and structural parallels to The Aeneid (75). Yet what interests Stevens most is the discrepancy between Aeneas’s journey to Hades and the explorers’ descent through the geologic strata of the earth. Stevens sees the scientific exploration of the center of the earth found in this novel as a metaphor for how the “mere tradition” of the classics were being replaced in the nineteenth century by the “knowledge” of a far more scientific age (75). While Virgil’s hero learned of the future of his people from the shades of people from his own personal past, the heroes in this novel learn of the past through scientific observation. Thus, Stevens argues, Verne envisions “offers an image of the ‘hero’ redefined as modern scientific man” (76). Stevens goes on to write that the “new, materialist definition of ‘knowledge’ excludes the classics entirely, classifying them as mere ‘tradition’” (101). Once again, this early work of SF defines the genre and comments on its contemporary world by eschewing the mystical in favor of the secular and scientific. The final work of Part I, “Mr. Lucian in Suburbia: Links between the True History and The First Men on the Moon” by Antony Keen, returns to works that focus on the moon. As with Kepler’s work, Wells’s novel about a voyage to the moon owes a great debt to Lucian’s True History. Keen argues that, like Lucian, Wells uses the narrative structure of a fantastic journey to the moon as social criticism, particularly in terms of class criticism (much like Wells uses SF as a vehicle for social critique in The Time Machine) and in criticisms of the nature of the British Empire. Keen also produces a list of sequences that draw directly on the incidents Lucian’s text. In addition to Lucian, Keen also briefly discusses other sources in a tradition of literature about fantastic journeys that Wells drew upon for his novel, including authors such as Swift, Milton, Kepler, Cyrano de Bergerac, and others. As the editors note in their introduction to this volume, the essays are arranged in a roughly chronological order. Keen’s essay, then, is a fitting conclusion for the first section, as the essays have progressed from Swinford’s discussion of Kepler conflating mystical and scientific notions of the moon in his Somnium to Wells’s description of a journey to the moon that is solidly grounded in scientific speculation (wild speculation, perhaps, but definitely based on scientific musings rather than spiritual impulses). In the long gestational state of modern SF, from the seventeenth through the nineteenth centuries, Western thought shifted from a mystical/religious view of the cosmos based on tradition to a scientific view based on observation. With the dawn of the twentieth century, SF was now ready to move into a new era, and many works that we now consider to be classics of the genre were made. Part II, entitled “SF ‘Classics,’” focuses on works created in the 1950s through the 1980s. By this time, the editors note, SF had come into its own as a recognizable genre, and “direct evocation of the classical past” was no longer a primary of many of the authors and directors producing SF (22). So instead of direct quotations and borrowings of plots and themes, many works of SF were influenced by “classical epistemologies,” such as “how Aristotle shapes our ideas about how to produce drama, how Hesiod and Ovid shape our thinking about time,” and other such “transcultural poetics” that frame many of these stories in a setting originally inspired by classical thought but familiar to modern SF audiences. The first essay of this section, “A Complex Oedipus: The Tragedy of Edward Morbius,” by Gregory S. Bucher, argues that this film, long recognized as a retelling of The Tempest, is also, as Bucher puts it, “animated by a Sophoclean heart,” and owes much not only to Oedipus Rex but also to Aristotle’s discussion of the tragedy in his Poetics (124). Bucher downplays the possible incestuous theme and instead focuses on the hubris of the main character of the film, Morbius. Morbius and his daughter live on a planet where he has discovered a powerful alien machine, yet he does not quite know what it is for. As it turns out, it is a machine that can make thoughts and desires, even deeply suppressed ones, manifest in the physical world. Years earlier, the “id monster” created by Morbius killed all of the other settlers on the planet, sparing only himself and his daughter. In these events, Bucher sees several echoes of Oedipus. Morbius is a man completely confident in his own power to solve a Sphynx-like riddle, yet he is not insightful enough to know his own mind, or to see what is actually a fairly obvious answer to a mystery that has vexed him for years. Thus Morbius, blinded by his pride in his own abilities, brings about his own downfall. With this Oedipus-like focus on hubris, Bucher sees a distinctive Greek influence that blends together with the film’s otherwise Shakespearean bent. The next essay, “Walter M. Miller, Jr.’s A Canticle for Leibowitz, the Great Year, and the Ages of Man” by Erik Grayson, examines Greco-Roman influences on Miller’s novel in terms of theories of time, Greek- and Roman-inspired names, and notions of cultural downfall inspired by a cultural memory of the collapse of the Roman Empire. Though many critics have pointed to the historical, monastic record of the Middle Ages as providing a cultural context for the sense of time in this novel, Grayson argues that “given its decidedly cyclical nature, [the novel’s vision of human history] is actually closer to visions conceived of by the Greek Pythagoreans and Roman Stoics” and articulated by ancient writers such as Hesiod, Plato, and Ovid (146). This time-frame creates a vision of growth and collapse that bears many similarities to Greco-Roman myth and philosophy. Additionally, Grayson posits that the many names which derive from Greek and Latin words, such as “Arkos,” “Fingo,” and “Dr. Cors” (159–60) serve “the dual function of adding nuance to the author’s characterization and ensuring that readers continue to contemplate the book’s relationship to the classical world throughout the text” (160). The presence of these names suggest the persistence of the past into the present, both in our actual human history as well as in this speculative timeline. Finally, the ideas of cultural collapse and resurgence that pervade the novel echo the cultural memory of the rise and fall of Rome, the cycle of Medieval society, and the rise of our own modern world. Through a combination of both overt allusions and subtle narrative framing, A Canticle for Leibowitz articulates a vision of human history that is heavily predicated upon the philosophies of the Greco-Roman world. In a far more subtle way, classical literature also provides a foundation for Frank Herbert’s novel Dune. In “Time and Self-Referentiality in the Iliad and Frank Herbert’s Dune,” Joel P. Christensen asserts that Homer’s classic work serves as an archetypal forerunner for Herbert’s story. Christensen argues that both the Iliad and Dune use storytelling to “facilitate the exploration of individual identity and psychology, the examination of social structures, and the search for humankind’s place in the universe” (162). Christensen sees these works as both coming from storytelling traditions that are highly aware of their own epistemological strategies, and which contain a high degree of self-referentiality within their narratives. This self-referentiality affects notions of time within the work, thus conflating past, present, and future, and causing each narrative to contemplate “its own repeatability and, in turn, the consequences of storytelling (especially heroic tales)” (171). Christensen’s essay creates a nice dialogue with Grayson’s, and in tandem these two chapters offer an interesting view of the closely connected natures of both ancient mythological epic and modern SF. The final essay in this section, “Disability as Rhetorical Trope in Classical Myth and Blade Runner” by Rebecca Raphael also focuses more on the cultural literary milieu left to the contemporary world by classical myth rather than direct influence or allusion. In this essay, Raphael examines the relationships between stories in Greco-Roman myths of artificial beings and the Ridley Scott film about androids, Blade Runner. In so doing, Raphael analyzes “how artificial beings rhetorically define the human” and what this says about “two phases of Western civilization’s engagement with the idea of artificial life (177). Raphael discusses Donna Haraway’s work on the cyborg, citing her argument that “human-machine hybridity defies the possibility of a unitary origin” thus “destabilize[ing] boundaries between the binaries human/animal, organism/machine, and physical/non-physical. Thus, cyborgs evoke horror” (177). Raphael contrasts this view, however, with the one found in classical myth, which contains no such horror. One myth Raphael looks at, that of the maidens of Hephaestus, is completely devoid of any dread or angst at their own existence. The maidens are happy servants of the blacksmith god. In much the same way, the bronze warrior Talos from the Argonautica of Apollonius of Rhodes performs his function as a guardian without complaint. However, in both Do Androids Dream of Electric Sheep? and its film version Blade Runner, the “Replicants” resent their differences from humans, particularly their status as servants, their short lifespans, and the manipulation of their emotions. Ultimately, Raphael argues the characters in the film “function as cautionary examples of what humans can be, but should not be” and that “[t]he monstrous, disabled, near perfect simulated beings of Blade Runner embody the postmodern fear that we have become too completely artificial” (196). In contrasting the different emotional responses to artificial beings in classical and modern literature, Raphael’s article calls to mind one of the chief epistemological concerns raised in Frankenstein and in many other SF works: has humanity progressed to a point where we are no longer sure of what precisely makes us human, and have we now created technology that we cannot control? Part III, “Classics in Space,” has much in common with Part II, except (of course), the works analyzed take place in space. The editors also point out that “the chapters in Part III suggest that such topics as the breakdown of boundaries, utopias and dystopias in society, and hybridities in the human body and indeed in ‘humanity’ are not only ‘science fictional’ but are equally of interest in certain ancient classics” (23). It is only fitting that this volume have a section devoted exclusively to space since so much of SF takes place there, and since it is in many ways the ultimate symbol of endless possibility. The section begins with “Moral and Mortal in Star Trek: The Original Series” by George Kovacs. Star Trek is of course one of the most recognizable franchises in all of contemporary SF, and its Utopian vision of the future serves as one of the foundations of its success. Kovacs’s essay insightfully examines how the show’s articulation of the human future was cobbled together by a motley crew of writers working to fulfill producer Gene Roddenberry’s vision. Often racing against the clock, these writers turned to the classical world for storylines for several episodes, including “Plato’s Stepchildren” and “Bread and Circuses.” Yet the episode that Kovacs sees as engaging the most meaningfully with the classical world is “Who Mourns for Adonais?” In this episode, the crew of the Enterprise encounters the Greek gods. The gods, as it turns out, are interstellar beings who visited Earth thousands of years ago, whereupon the people of ancient Greece worshipped them as deities. Eager to be worshipped once again, Apollo attempts to force the crew to worship him as the Greeks once did. However, Kirk, Spock, and McCoy outsmart Apollo and destroy the source of his power. Kovacs sees in Apollo an apt representative of “a number of omnipotent characters in TOS who are depicted as emotionally and morally inferior to the mortal protagonists,” and he goes on to say that “[i]n the ethical logic of TOS, conditions of immortality and omnipotence, as well as situations of paradise, lead to stagnation (on the individual level, as with Apollo, or the societal, as with the Platonians … ) and therefore a negation of humanity’s natural development” (209). In many ways, this episode articulates Gene Roddenberry’s vision for humanity’s future—one free from superstition and slavery. While Star Trek concerns humanity’s venturing into space, the film Alien Resurrection explores issues of homecoming. Brett M. Rogers explores the connection between this film and the Odyssey in his excellent essay, “Hybrids and Homecomings in the Odyssey and Alien Resurrection.” Rogers cleverly compares the journey home of Ellen Ripley to that of Odysseus. Like Odysseus, Ripley has been changed by her journeys, and her homecoming forces her to contemplate who, and even what, she is. As a clone produced from the DNA of the original Ellen Ripley and from the DNA of the Aliens, Ripley’s homecoming is not really a homecoming at all. It is, in fact, the first time she has ever set foot on earth. Rogers sees a parallel in the homecoming of Odysseus, who in his travels to lands inhabited by barbarous peoples and monsters, has undergone a significant amount of change himself. Rogers sees Ripley’s statement, “I’m a stranger here myself” (236) as a pivotal moment in the film. Ripley utters this sentence while staring into the ruins of Paris, and Rogers cites Raz Greenberg’s observation that, now that Ripley’s homecoming has been achieved, she must once again set off on a journey back into human society that brought about an apocalypse on itself (236), thus raising the question of what is the nature of humanity? The section on space concludes with Vincent Tomasso’s “Classical Antiquity and Western Identity in Battlestar Galactica.” BSG is a series that contemplates the role of the past in the future. Just as this volume began with authors from the past, such as Kepler, occupying a strange moment in time where mysticism and scientific inquiry are coeval, this series looks forward to a future where ancient gods and even their idols persist into the future. Taking the opposite view espoused by Gene Roddenberry and Star Trek, BSG considers the beneficial aspects of religion. As Tomasso observes, “myths are indispensable for locating a place where life can continue” and that to break out of the cycle of cultural collapse and destruction, this series suggests that “humanity must embrace a mythic hermeneutic and hybridize its traditions as well as reject the technology that leads to arrogance and decadence” (258). Much like other SF works covered in this volume, BSG uses the cultural memory of the collapse of the Roman Empire as a potent reminder of what may be in store for all of humanity on an even grander scale. The final section, “Ancient Classics for a Future Generation?” looks at more recent SF that consciously recreates the classical world for direct comparison with the present (or near future). The editors assert that these final chapters “round out the volume’s emphasis on links between those seemingly disparate worlds by suggesting that a theme of great importance in modern SF is the capacity of other worlds, whether future, past, or simply alternative, to serve as thought experiments about important or contentious aspects of this world” (23). These last chapters illustrate that SF creators still today look to the classical past for inspiration. This section begins with Gaël Grobé’s “Revised Iliadic Epiphanies in Dan Simmons’s Ilium,” in which Grobé considers scenes from the novel Ilium and analyzes, as he says, “its struggle to replace Homeric values and beliefs with new preoccupations valued by modern society,” particularly the “opposition [to] religion and the relationship between men and gods” (264). In this work, a twenty-first century literary scholar and expert on Homer, Thomas Hockenberry, is cloned thousands of years in the future by technologically-altered superhumans who wish to live the lives of the gods of the Iliad. They have cloned him and compel him to observe their recreated mythic universe to ensure its accuracy. Grobé sees the moment of epiphany as the focus point for the epistemological concerns in this novel. In the Iliad, gods appear in mysterious epiphanies that were once ambiguous. As an Iliad scholar, Hockenberry had always wondered if the epiphanies in that epic were metaphors for characters’ own sudden moments of intellectual clarity. With the superhuman “gods,” however, the moment of epiphany becomes, as Grobé says, “demystified via technology, … the tool of a masquerade” (278). With this disillusionment, Hockenberry rebels against the gods, and asserts the concerns of individuality and free will valued by our contemporary age. In “Refiguring the Roman Empire in The Hunger Games Trilogy,” Marian Makins explores the ties between the Roman Empire and the world of The Hunger Games, as well as our own entertainment culture with its appetite for reality television. Makins points out several elements clearly borrowed from Roman history: the empire, the imperial living lives of opulence at the expense of the provincials whom they ruled, gladiatorial contests, and the concept of “bread and circuses.” In an overt allusion to ancient Rome, one of the characters who imparts some of the suppressed knowledge to the main character, Katniss Everdeen, is named Plutarch Heavensbee. He tells Katniss the meaning of the phrase “panem et circenses” and gives her an understanding of the socio-economic realities of the empire (304–05). Once again, Rome emerges in a work of SF as a cautionary archetype. Instead of the chaos of collapse, though, we see in The Hunger Games the decadence and dehumanization that leads to just such a collapse. The volume concludes with C. W. Marshall’s essay “Jonathan Hickman’s Pax Romana and the End of Antiquity.” In this essay, Marshall considers the different ways in which different audiences react to this time-travel graphic novel. In the work, the Catholic Church in 2053 has been rendered nearly obsolete due to the expansion is Islam. The Church, having discovered time travel, decides to send soldiers with modern weaponry, including nuclear weapons, back in time to help the emperor Constantine to ensure that the Roman Empire never falls, and that the Catholic Church is kept forever in a position of authority. Marshall argues that the recreation of the Roman Catholic world explores the nature of human existence, and leads readers to arrive at different conclusions, depending on what each reader brings with them (320). Ultimately, as Marshall notes, human experiences such as “[f]actionalism, strife, envy, ambition, pride, mercy, doubt, lust and faith all still exist and are shown to shape events at the level of the individual” (325). Hickman’s alternative world suggests that no matter how many times civilization fails and rebuilds itself, it will always fall into the same follies. Interestingly enough, though the genre of science fiction has evolved greatly since the time of Kepler, and though the genre is very often focused on the future, the persistence of classical traditions on science fiction seems to offer no signs of waning. This volume offers valuable insights on a genre that is ever-evolving, and that simultaneously has its roots deeply situated in classical literature.